Tonight/today is Yuri’s Night, an international celebration held on April 12 every year to commemorate space exploration milestones. 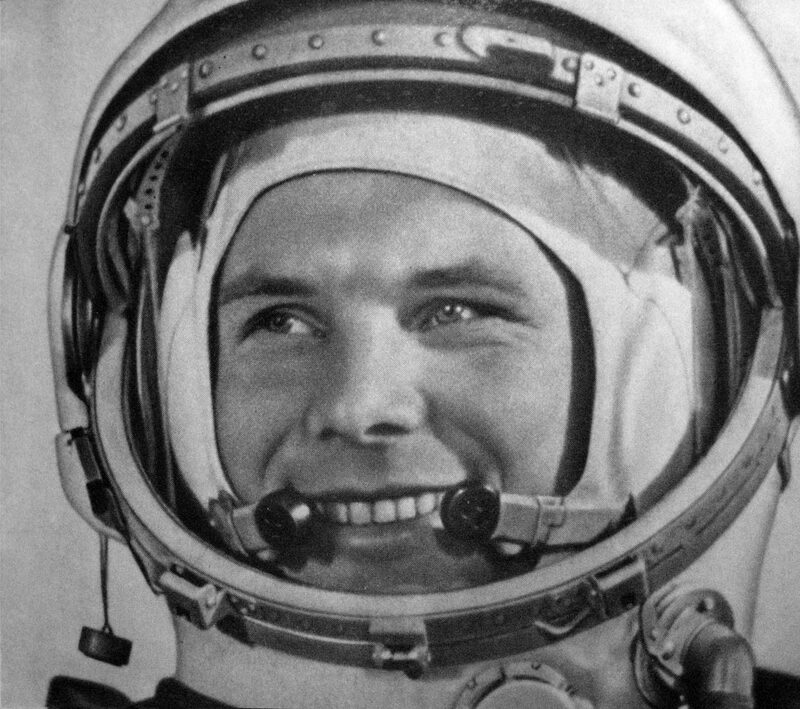 The event is named for the first human to launch into space, Yuri Gagarin, who flew the Vostok 1 spaceship on April 12, 1961. The launch of STS-1, the first Space Shuttle mission, is also honored, as it was launched 20 years to the day of the launch Vostok 1, on April 12, 1981. In 2013, Yuri’s Night was celebrated at over 350 events in 57 countries. The goal of Yuri’s Night is to increase public interest in space exploration and to inspire a new generation of explorers. Driven by space-inspired artistic expression and culminating in a worldwide network of annual celebrations and educational events, Yuri’s Night creates a global community of people committed to shaping the future of space exploration while developing responsible leaders and innovators with a global perspective. These global events are a showcase for elements of culture that embrace space including music, dance, fashion, and art. Yuri’s Night was created by Loretta Hidalgo, George T. Whitesides, and Trish Garner. The first Yuri’s Night was held on April 12, 2001, on the 40th anniversary of human spaceflight. This global celebration was preceded by Cosmonautics Day, which was established in the Soviet Union in 1962. Locations with major Yuri’s Night celebrations have included Los Angeles, the San Francisco Bay Area, Huntsville, Alabama, New Orleans, Inverness, Stockholm, Tel Aviv, Tokyo, Lisbon, Afghanistan, Latvia, Romania, Peru, Antarctica, and the International Space Station, as well as virtual online celebrations. Yuri Gagarin was born in the village of Klushino, near Gzhatsk (renamed Gagarin in 1968 after his death), on 9 March 1934. His parents worked on a collective farm. His father, Alexey Ivanovich Gagarin was a carpenter and bricklayer, and his mother, Anna Timofeyevna Gagarina was a milkmaid. Yuri was the third of four children: older brother Valentin, older sister Zoya, and younger brother Boris. 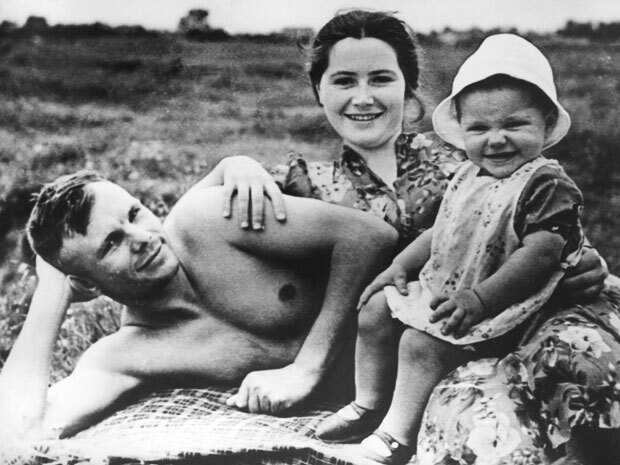 Like millions of people in the Soviet Union, the Gagarin family suffered during Nazi occupation in World War II. Klushino was occupied in November 1941 during the German advance on Moscow, and an officer took over the Gagarin residence. The family was allowed to build a mud hut, approximately 3 by 3 meters (10 by 10 ft) inside, on the land behind their house, where they spent a year and nine months until the end of the occupation. His two older siblings were deported by the Germans to Poland for slave labor in 1943, and did not return until after the war in 1945. In 1946, the family moved to Gzhatsk, where Gagarin continued his secondary education. 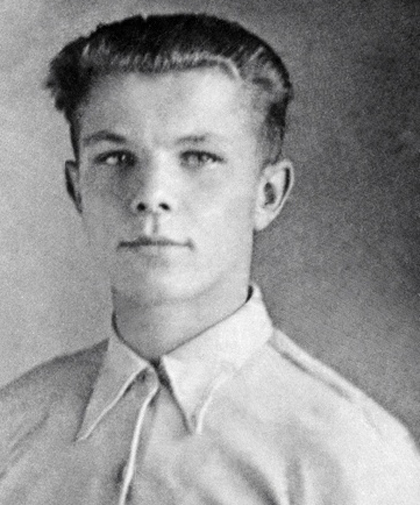 At the age of 16 in 1950, Gagarin entered into an apprenticeship as a foundry worker at the Lyubertsy Steel Plant near Moscow, and also enrolled at a local “young workers” school for seventh grade evening classes. After graduating in 1951 from both the seventh grade and the vocational school (with honors in mold making and foundry work), he was selected for further training at the Saratov Industrial Technical School, where he studied tractor repair. While in Saratov, Gagarin volunteered for weekend training as a Soviet air cadet at a local flying club, where he learned to fly — at first in a biplane and later in a Yak-18 trainer. He also earned extra money as a part-time dock laborer on the Volga River. 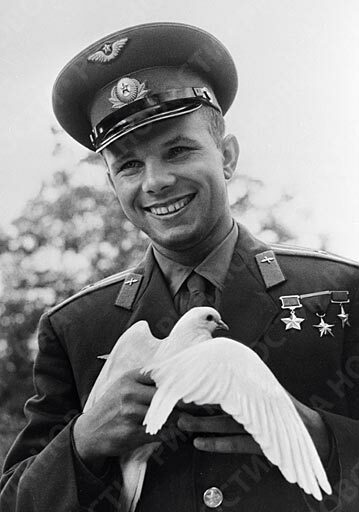 After graduating from the technical school in 1955, the Soviet Army drafted Gagarin. On a recommendation, Gagarin was sent to the First Chkalov Air Force Pilot’s School in Orenburg, and made his first solo flight in a MiG-15 in 1957. While there he met Valentina Ivanovna Goryacheva, a medical technician graduate of the Orenburg Medical School. They were married on 7 November 1957, the same day Gagarin graduated from Orenburg. Post-graduation, he was assigned to the Luostari airbase in Murmansk Oblast, close to the Norwegian border, where terrible weather made flying risky. He became a Lieutenant in the Soviet Air Forces on 5 November 1957, and on 6 November 1959 was promoted to Senior Lieutenant. In 1960, after a long selection process, Gagarin was chosen with 19 other pilots for the Soviet space program. He was further selected for an elite training group known as the Sochi Six, from which the first cosmonauts of the Vostok program would be chosen. Gagarin and other prospective candidates were subjected to experiments designed to test physical and psychological endurance; he also underwent training for the upcoming flight. Out of the twenty selected, the eventual choices for the first launch were Gagarin and Gherman Titov due to their performance during training sessions as well as their physical characteristics — space was limited in the small Vostok cockpit, and both men were rather short. Gagarin was 1.57 metres (5 ft 2 in) tall. Gagarin was also a favored candidate by his peers. When the 20 candidates were asked to anonymously vote for which other candidate they would like to see as the first to fly, all but three chose Gagarin. Following the flight, Gagarin told the Soviet leader Nikita Khrushchev that during reentry he had whistled the tune “The Motherland Hears, The Motherland Knows” (“?????? ????? ?, ?????? ?????”). The first two lines of the song are: “The Motherland hears, the Motherland knows/Where her son flies in the sky.” This patriotic song was written by Dmitri Shostakovich in 1951 (opus 86), with words by Yevgeniy Dolmatovsky. 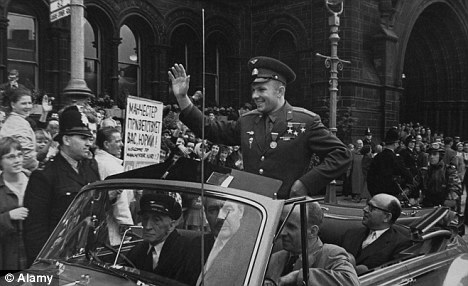 After the flight, Gagarin became a worldwide celebrity, touring widely abroad. He visited Italy, Germany, Canada, Brazil, Japan, Egypt, and Finland to promote the Soviet Union’s accomplishment of putting the first human in space. He visited the United Kingdom three months after the Vostok 1 mission, going to London and Manchester. In 1962, he began serving as a deputy to the Supreme Soviet of the Soviet Union and was elected to the Central Committee of the Young Communist League. He later returned to Star City, the cosmonaut facility, where he spent seven years working on designs for a reusable spacecraft. He became a Lieutenant Colonel of the Soviet Air Forces on 12 June 1962, and attained the rank of Colonel on 6 November 1963. Soviet officials tried to keep him away from any flights, being worried of losing their hero in an accident. Gagarin was backup pilot for his friend Vladimir Komarov in the Soyuz 1 flight, which was launched despite Gagarin’s protests that additional safety precautions were necessary. When Komarov’s flight ended in a fatal crash, Gagarin was permanently banned from training for and participating in further spaceflights. Gagarin became deputy training director of the Star City cosmonaut training base. At the same time, he began to re-qualify as a fighter pilot. On 27 March 1968, while on a routine training flight from Chkalovsky Air Base, he and flight instructor Vladimir Seryogin died in a MiG-15UTI crash near the town of Kirzhach. The bodies of Gagarin and Seryogin were cremated and the ashes were buried in the walls of the Kremlin on Red Square. To celebrate Gagarin I am giving a recipe for kasha. In my March 21 (Mussorgksy) post I quoted an old Russian saying: “Щи да каша — пища наша.” (Shchi da kasha — pishcha nasha “Shchi and kasha are our food”). There I gave a recipe for shchi, so now it’s kasha’s turn. 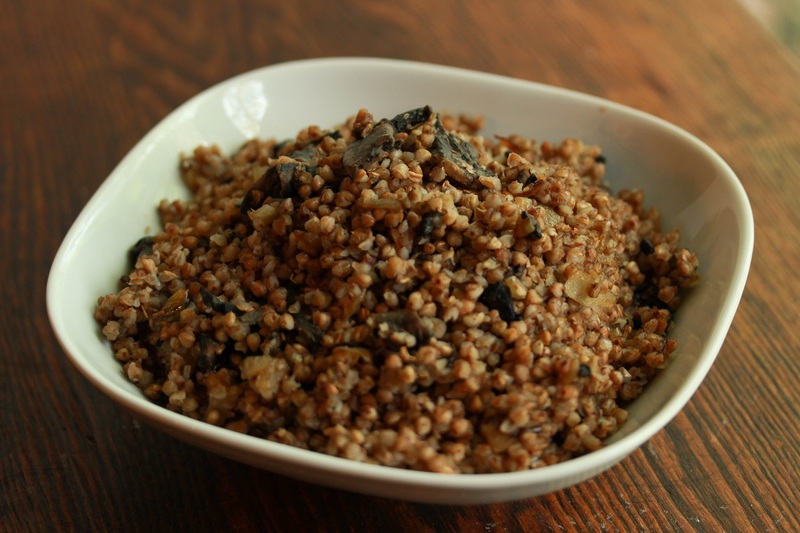 In Russian kasha is a general term for any kind of cereal porridge, but in the Smolensk district where Gagarin was born, buckwheat is the common cereal. Kasha (in Russian more usually in the plural – “kasha”) is made plain as you would make oat porridge from scratch. But for more substance it is usual to add some meat for a heartier meal. I found a recipe for kasha with brains but decided to go with partridge. You can use any meat you choose. This is my translation from a Smolensk website (with a few liberties). Bring 7 cups of salted water to the boil in a large saucepan. Add 1 tablespoon of butter, stir well, and then add the grits. Stir constantly until the porridge thickens. Then cover tightly and cook on a low flame for 40-50 minutes. Meanwhile, clean and joint the partridge. Fry the pieces very slowly in 2 tablespoons of butter. When the meat is cooked through, take it from the bone, chop it finely, and return to the butter to heat through. Add the meat to the kasha when it is cooked, stir in the final tablespoon of butter and serve hot.